Once parts have been created for machinery or structures, often it’s required that they are given a durable finish, with the right colours and branding, so they’re fit for purpose. Within certain industries, such as automotive, military, and aerospace, these coatings need to be as robust as possible in order to stand harsh conditions and the test of time. We’re experts in paint and powder coating here at Electropak, so we’ve outlined the many benefits of these techniques, what they’re used for, and how to get in touch. Paint coating is where multiple layers of paint are applied on top of each other to improve the durability of a product, as well as its appearance. Primers are used initially; then the immediate coats, which add thickness; finishing off with the final coat, which will predominantly be used to defend against harsh weather conditions and general wear and tear. Powder coating is the process of applying a dry powder to your product, which is then manipulated through heat. The powder is applied electrostatically, which means charged particles are sprayed onto the product with powerful force. The coverage is efficient and clean, creating a more robust finish by creating thicker coatings. The number one benefit of paint and powder coating is that the finish can immediately improve the overall quality of the product, as efficiency is increased and the specification is higher. This increases its lifespan and adds value to the product. Paint and powder coatings allow you to add that much needed colour to your products or machinery. Whether this is by making them more aesthetically pleasing or for camouflage purposes, it’s an essential part of the finishing process and one which needs to be of high quality to reflect the status of your brand or company. Powder coatings can also produce a thicker coating, as opposed to their counter liquid coatings, which can often run and sag. 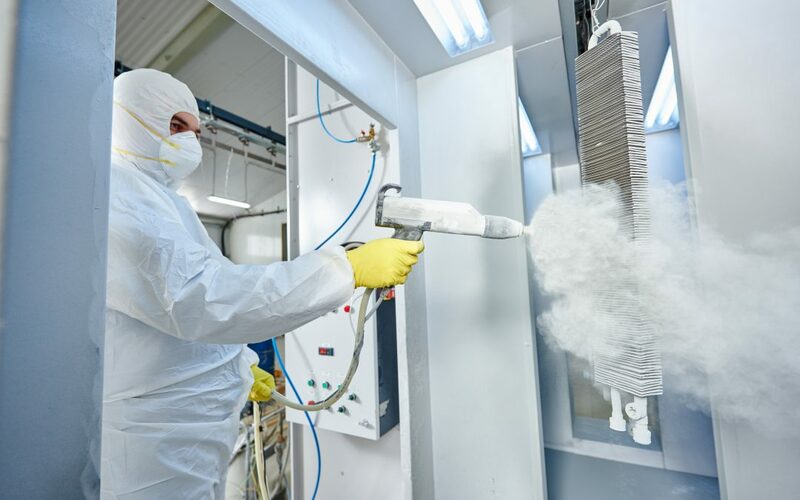 Most products which need to utilise paint or powder coatings are the toughest machinery, so this process is essential for certain industries, such as aerospace, military, and automotive. It provides one of the longest lasting colour finishes available for metal, staying vibrant for longer, and keeping the products. These coatings provide hardness and are used for metals to create a more robust and tougher finish. Epoxy coatings often used as primers in marine paints and the aerospace industry because they can prevent rusting and deterioration of the parts, as well as providing additional protection. Without the presence of solvents, when applied, these are not released into the environment. The coatings also aren’t flammable. At Electropak, we also have a environmentally controlled paint facility, approved to AS9100 rev. D and by BAE Systems. From application to lasting finish, both paint and powder coatings are extremely cost effective. Contact Electropak today for more information on how we can apply paint and powder coatings to your machinery or parts.